The queries in Microsoft Access are fantastic. They allow you to perform a wide variety of very powerful analysis and actions. 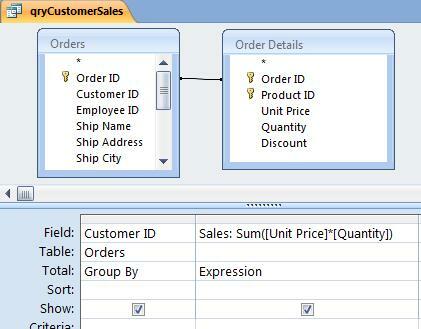 They can be chained together (one query uses another query), and are used throughout MS Access forms and reports. There are many types of queries. Most users are familiar with queries that generate results: select queries, select queries with totals, and crosstabs (which Excel users appreciate the most). By default, Access Select queries are updateable (editable). When you view the datasheet of a Select query, you can edit the results and your changes are saved in the underlying table. This works even when the query returns records from more than one table. Unfortunately, there are situations where the query results are not updateable. The table being modified is a linked table without a primary key. For certain backend databases (e.g. Microsoft SQL Server), Access/Jet requires the table to be keyed to make any changes. This makes sense since Access wants to issue a SQL query for modifications but can't uniquely identify the record. The most obvious and annoying situations are queries on one table with totals (Group By, Sum, Count, Average, etc.) that aggregate multiple records. You wouldn’t expect to edit that since you are not viewing individual records. However, if any portion of your query contains a summary (GROUP BY) field, all the fields of the returned records are not editable (not just the summary fields). This paper discusses some ways around this limitation. The query results are very nice and can be used in forms and reports. However, it is not updateable. You wouldn’t expect to edit the Sales field, but you’d think Access would let you edit the customer fields (except for the Customer ID). No such luck. 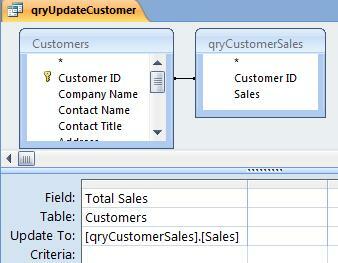 Because there is a summary in the query, the entire query and all its fields are not updateable. This is very annoying. One way to resolve this is to use module code to open two recordsets: one for the Customers table and one for the qryCustomerSales query, then manually update the Customers records. That’s a lot of work and a pain to maintain or understand. A better way is to use temporary tables. By using temporary tables, you can eliminate a lot of unnecessary code. An alternative to Make-Table queries is an Append query. Append queries let you insert records from a query into an existing table. If you just have a one step process, there usually is not much difference. However, if you have multiple steps, Append queries have a clear advantage. 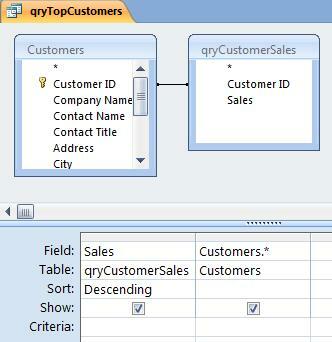 Append queries let you create the table in advance with specific field names and field types. Make-Table queries assigns its own field types for expressions, which may be a problem for the text width of text fields and number fields. This is particularly important if you need to use those fields to link to other tables. An Append query can use a table with indexes and other field formatting that a Make Table query cannot specify. Append queries can be used to insert records into a table with fields not in the query. The fields may be updated later with other queries. Append queries let you accumulate results from multiple queries in one table. Create the target table. I usually use a Make-Table query to do this, then manually designate a key field, modify the field names, types, settings, and descriptions. Create forms, reports, or other analysis based on the data in the target table. 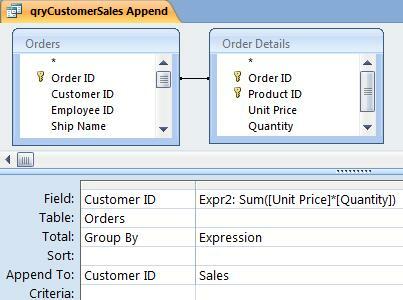 Here's more information on Microsoft Access Append and Insert Queries. If you use temporary tables, you need to consider multi-user issues. 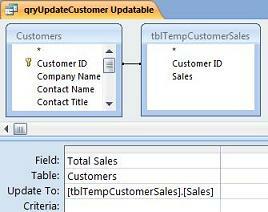 You cannot have two people creating and using the same temporary table in the same database. 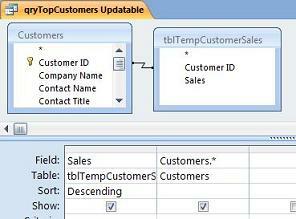 Each user must have their own database where temporary tables are created and used. The database can be linked to a shared database containing the data, but your application must be in a separate database. This is the proper way to design an Access application anyway. Make sure you spend the time to understand how to use Access queries. They are extremely powerful and eliminate a lot of unnecessary coding. They are also much easier to debug than module code. The use of temporary tables is fundamental to working around the annoying non-updateable queries problem, and also for performing advanced data analysis. Luke Chung is the president and founder of FMS, Inc., a database consulting firm and the world's leading developer of Microsoft Access add-in products. He is the designer and co-author of several Access add-ins including Total Access Analyzer, Total Visual CodeTools, Total Access Detective, Total Access Emailer, Total Visual SourceBook, and Total Access Statistics. He has spoken at a variety of conferences and user groups.